« im realizing that im a bad loser. what’s there to say, any time i raised my hand up in the air, somebody would fall over. instead of golden trophies of basketballs they should be handing out oscars. and the refs should get best supporting actor awards. how many times did kobe drive the lane and they swallowed their whistles? all the time. f the refs. why do you think it went down that way? they want parity in the nba. they dont like the fact that the lakers could just sign two great stars like karl and gary and win another ring. they want the east to look stronger than it is. they want some new heroes. they want the kids wearing fake afros and the Bad Boys to make a return to the nba. they want to reward larry brown and punish the answer. they want this to be the wwf, wwe, whatever. they want there to be a badder group of dudes than the baddest. we’re the baddest dudes. nobody can take that from us. but they can hand rings to others. shaq, some say that they called the finals the way that they should have called the last 5 years. they called you for fouls cuz you constantly elbow and manhandle. if thats the case, then they picked a rotten time to start enforcing the rule. thats like suddenly calling knee high strikes strikes during the world series when you havent called them all year. and what about in minnesota when my boy madsen was dateraping me and still didnt get a foul called on him. why do you think its like that? its easy. its psychology. you see a big huge guy. then you see a bigger huger guy. if the bigger guy is standing there getting fouled by a smaller guy it doesnt look like a foul, it looks like the smaller guy is just trying real hard. but indeed it is a foul. its a real foul. if you prick me, dont i bleed? as a matter of fact, ive never seen you bleed shaq. well, i do. i bleed inside. where it counts. so whats next for the lakers? f the lakers. im on vacation. and all im going to do is try to get a new president elected. i cant stand bush and i didnt even like reagan. do you know that reagan is the reason why saddam had the gas that he used on “his own people”? the kurds? no i didnt know that. bro, get thee to a library. 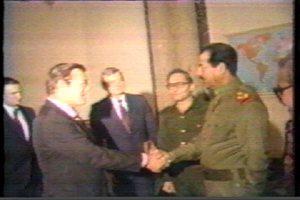 rumsfeld was sent by reagan as his special envoy to iraq to do, among other things, ensure the delivery of chemical weapons that saddam used, not just on iranians, like reagan wanted, but on the kurds. and even after he did that reagan and rummy were buddies with him. we enabled saddam to be the bad guy that he is, was, whatever. and now george bush jr is going to be the guy who rids the world of him? talk about a straw man. what about your free throws? how are you going to approach them in the off-season? will phil return? what about kobe? are you two friends now?